I had this page set to password protected, but now it’s not since I feel that the info on this page may be useful to other folks than just myself. Enjoy it (for now – may go password protected again later at some point. If I do password will likely be something silly stupid easy to access like “emr”). Yes, I did pass my nremt emr test a few weeks back, and am currently training for my new job…. info below helped me get to this point. NOTE: NONE OF THE BELOW INFORMATION IS INTENDED TO BE COPYRIGHT VIOLATIONS OF ANY TYPE. IF YOU BELIEVE THAT YOU ARE THE COPYRIGHT HOLDER TO INFORMATION BELOW AND THAT IT SHOULD BE REMOVED FROM THE BELOW LIST, PLEASE CONTACT ME AS SOON AS POSSIBLE SO THAT I CAN SEE ABOUT REMOVING THE OFFENDING INFORMATION. THANK YOU. Here is an in-depth guide to road safety for parents – http://www.sr22insurance.net/a-comprehensive-guide-on-road-safety-for-parents/. This guide has advice categorized by age group; from picking the right car seat for a newborn through to how parents can encourage their teen not to text and drive. LAB RAT. Left Atrium Bicuspid (mitral), Right Atrium Tricuspid. http://cteems.com/CTE_EMS/links.html – site with a lot of links on it that seem useful!… going to have to check em out since there’s a bunch listed. WHOO HOO! ACED THE PSYCHOMOTOR PORTION OF EMR TEST YESTERDAY, JULY 6, 2015. I signed up for LCready web app from Limmer Creative. I’ve got about 3 other paid for apps from google play so far, as well as a bunch of the freebie apps. I plan to work my way through each app as much as possible between now and the time that I have to take the real test, whenever that may be. S – SHOCK MANAGEMENT (NEEDED MOSTLY FOR TRAUMA, BUT POSSIBLY IN MEDICAL ASSESSMENT UNDER RIGHT CONDITIONS). MAINLY THIS WOULD BE PUT BLANKET ON PATIENT TO CONSERVE HEAT, BUT COULD ALSO POSSIBLY BE RAISE FEET… IF THE HEAD IS PALE, RAISE THE TAIL. iF THE HEAD IS RED, RAISE THE HEAD. PSYCHOMOTOR EMR test is at 2:30 this afternoon… BSMAC ->GACCAT->OPQRSTI->SAMPLE->FVFIT-PRBELLS-GOC. BSI, is scene safe, moi or noi (mechanism of injury or nature of illness), additional resources needed? (call ALS ambulance for backup, is this the only patient?) C-spine consideration (do always consider it, but only use it if needed… pass it off to the pretend firefighter if he’s available as additional resource)———>General impression, AVPU, chief complaint, ABCDEF(A-irway with cspine-OPA!! !-open airway/oxygen administration, OPA-oropharangeal airway insertion, Adequate ventillation…,–>B-reathing-BOAL-Breathe Oxygen, Airway, Lung Sounds–>C-Circulation-PBS-S-with bleeding control -pulse,bleeding control, skin color/temp/condition (yellow jaundice,blue cyanosis – lack of air, red-hot/fever, pink-normal, pale-shock, diaphoretic-sweaty, wet-really sweaty, dry, etc. 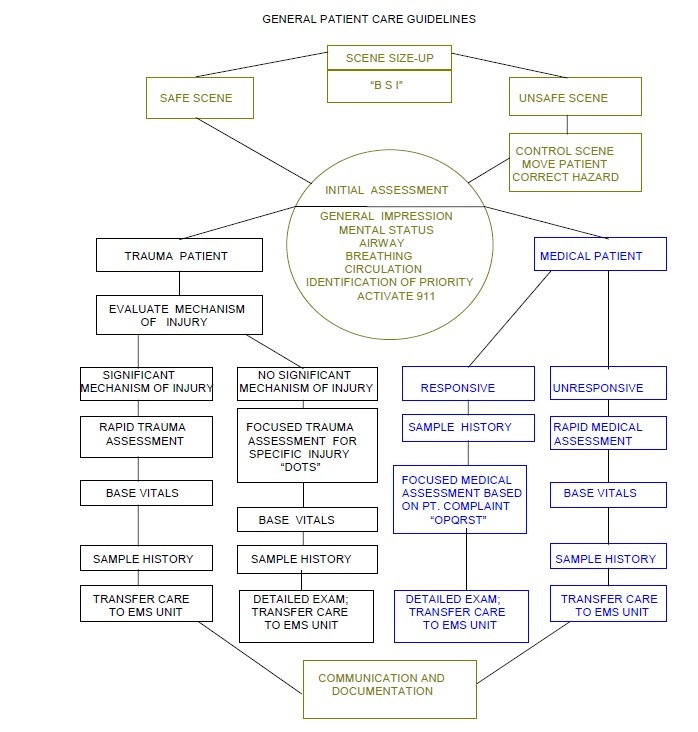 S-SHOCK->mainly trauma… put on a blankie as blanket conserves heat, even/especially if patient has been burned… D-Distended Abdomen, Elvis the Pelvis/E-xpose, Femurs with Neuro exam, )), transport decision based on gcs (glascow coma scale) score. Examine all 4 Extremities ———->OPQRSTI-onset – what brought on this problem/when, provocation – what do you do that makes this feel worse/better/explain, quality – in your own words describe exactly what you are feeling and be as detailed as you can be, radiation – does the pain or problem radiate anywhere or stay put, please point to exactly where it hurts and where it seems to radiate to/from, severity – on a scale of 0-10 with ten being worse pain possible how would you rate your pain level at this time, on the same scale how would you rate the pain level when this first began, and when was that time that it first began, time – exactly how long has this been going on? Has it happened before? SAMPLE – signs/symptoms, allergies (medical, environmental, food), Medications – dosages and explain what these prescriptions are for?Past history of present illness? Last oral intake, events leading up to this situation.More M-Do you take any illegal drugs, please explain what/how much… I a medical professional, not a cop. I just want to help you but need to know exactly what is going on with you… Focused questions, Vitals -PRBELLS-goc-(GOC NOT NECESSARY, BUT MIGHT HELP)PULSE, RESPIRATORY RATE, BLOOD PRESSURE, EYES -PEARLY RACOON -PUPILS EQUAL AND REACTIVE TO LIGHT RACCOON EYES?/EARS – BLOODY, CLEAR CEREBRAL SPINAL FLUID LEAKS?, BATTLE SCARS?, LUNG SOUNDS… LEVEL OF CONSCIOUSNESS (AVPU AGAIN), SKIN COLOR/TEMP/CONDITION… two sets of vitals is good baseline +another if possible before ambulance…GOC-glucose test, Oximeter test, Capillary Refill time test… reassess, reassess, reassess… Transport and give verbal handoff report. ——-direct pressure, pressure point, tourniquet +WATER, ETC. Criteria” statements and documented the performance as required. The US Library of Medicine: good information about diseases and disorders. Also drugs and herbal supplements. Be aware that some drugs are known by US brand name so always look up the generic name. English for Chinese Medicine, Dentistry, Medicine ,Medical Engineering and Nursing. Excellent resource for medical prefixes and suffixes and a pronunciation guide. Evidence of Best Practice site. Fact Sheets. We strive to live to be 120…. We Want to live to be 80…. We are Lucky to live to be 70…. 2008-01-30: A checklist for first tasks on scene of a motor vehicle collision. 2008-01-30: A different checklist for first tasks at an MVC. 2010-11-07: A checklist for handover of a trauma patient. Treatment – what have you done? 2012-02-23: The elements of a radio ringdown/passdown to a hospital. Mechanism. “Fall,” “MVC/MVA,” “Possible MI,” etc. Injuries. List all known injuries with severity of major ones. Treatment. What have you done to treat these conditions? This is the general order for treating a patient. 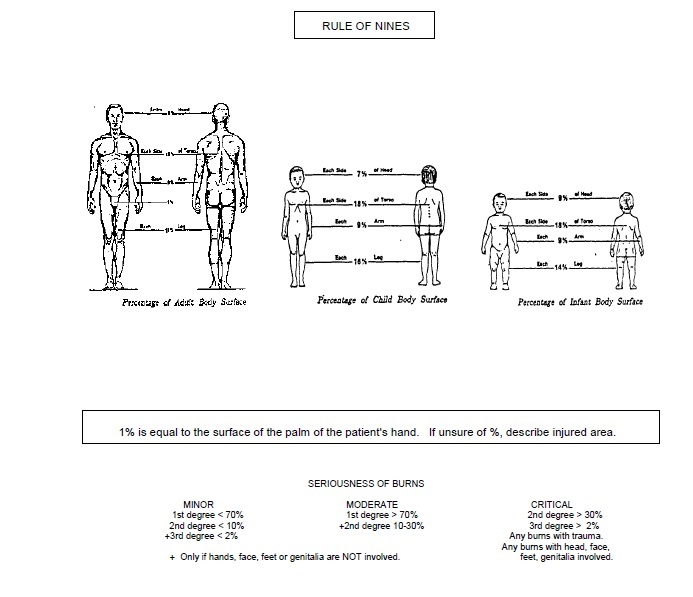 2008-01-30: This is a summary of a patient contact, from start to finish. The ABC’s are the critical steps in the Initial Assessment of a patient. SAMPLE is the acronym covering the details we need to get about any patient. 2012-02-23: The vital signs to take. 2012-02-23: Added L, M, and N to the start of the list. This is the list the mnemonic for evaluating a medical patient. This is an alternate mnemonic for evaluating a patient with difficulty breathing. This is the mnemonic to establish level of responsiveness. This mnemonic is used when evaluating extremities. 2008-01-30: Thanks to many contributions, I can now say that this mnemonic outlines the information needed following a seizure. These are the symptoms of excessive stimulation of body functions due to organophosphate poisoning. 2008-01-30: I can’t believe I never included this list for evaluating the eyes during a field exam! 2008-01-30: START is an acronym for a copyrighted system for triage. RPM is the list of specific actions taken in this system. 2010-11-07: Key parts of an ALS intervention. 2010-11-07: Elements of the Cincinnati Stroke Scale. This is an alternative to OPQRST. Character – What does it feel like? This is a list of some common drugs. 2008-01-30: Possibly a list of commonly abused drugs? The five drugs that may be adminstered by endotracheal tube. The seven types of shock. 2008-01-30: An alternative list of eight types of shock. http://www.emtresource.com/category/resources/acronyms/ – Blog that lists many resources and acronyms used by EMTs. PMS is used to assess a patient’s extremities and is often abbreviated as “PMSx4″ if everything is intact on all four extremities. START is used to categorize a patient’s priority status before moving them to the triage area.The initial assessment to categorize a patient by color is done by using ARPM and should not exceed 30 seconds. Red: Immediate care and transport required (Priority 1). Yellow: Delayed care and transport (Priority 2). Green: Only minor injuries (Priority 3). Black: Deceased or fatal injuries (Priority 4). PERL is used to assess a patient’s eyes and the pupil size is recorded in millimeters. PRBELLS is used to obtain vital signs when conducting patient assessments. NOTE: I LIKE TO ADD G.O.C. to the end of PRBELLS… G for glucose, O for Oximeter reading… C for Capillary refill time. 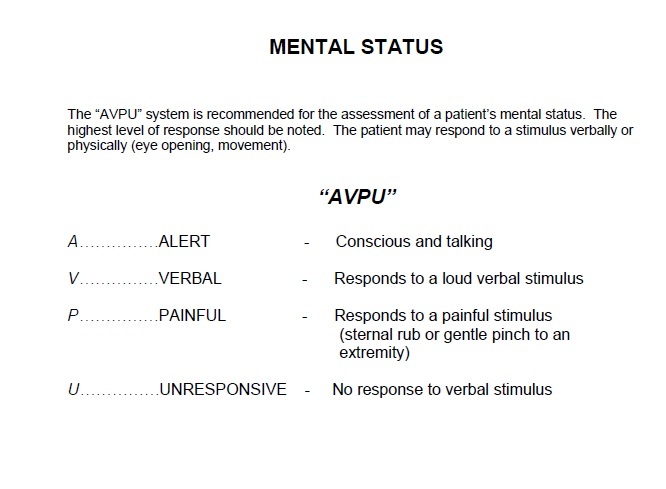 AEIOU TIPS is used to assess patients with an altered mental status (AMS) or an altered level of consciousness (ALOC). APGAR is used to assess newborns. 7-10 Points: The newborn is active and requires only routine care. 4-6 Points: The newborn will require additional stimulation and oxygen therapy. 0-3 Points: The newborn is not perfusing adequately and assisted ventilations with a bag-valve-mask (BVM) and CPR may be required. APGAR scores should be completed at 1 minute and 5 minutes after delivery. DCAP BTLS is used to assess trauma patients. ABC is used for the primary survey/resuscitation section of patient assessments. My instructor likes to add to this… see in other parts of this blog… airway with c-spine, breathing, circulation with bleeding control, distended abdomen, Elvis the pelvis/Expose, Femurs with Neuro Exam. BRIM CARB is used to assess trauma patients. AVPU is used for the primary survey/resuscitation section of patient assessments. The patient is alert and oriented to person, place, time and event. This is often abbreviated as A/Ox4. The patient responds to verbal stimuli. The patient responds to painful stimuli with a purposeful or nonpurposeful movement. The patient does not respond to any stimuli. OPQRST is used for the history taking section of patient assessments. What was the patient doing when the signs and symptoms first occurred? Was the onset sudden or gradual? Is there anything that makes the symptom better or worse? Description of what the patient is feeling. For example, the pain can be described as dull, sharp, crushing, aching, tearing, throbbing, etc. Where is the pain located and does it move to another part of the body? How severe is the symptom based on a scale of 1 to 10? When did the signs and symptoms first occur? SAMPLE is used for the history taking section of patient assessments. For respiratory emergencies, PASTE can be used in lieu of OPQRST for the history taking section of patient assessments. PENMAN is used for the scene size-up section of patient assessments. SLUDGEM is used to assess patients with an overdose or poisoning emergency. DUMBBELLS is used to assess patients with an overdose or poisoning emergency. Check THESE THREE THINGS when you first encounter the patient – Always introduce yourself to the patient using your name and while you’re doing this, feel their radial pulse with your fingers. This tells you three immediately important things that will drive the rest of your care: The status of their Airway, Breathing, and Circulation. You’ll feel the rate and quality of their pulse; feel their skin temperature, moisture, and condition; and be able to assess their work of breathing when they answer you back from your introduction. If any of these things are compromised… the patient is probably sick and in need of intervention. Mechanism of Injury if Trauma OR Nature of Illness if Medical? C – C – Chief Complaint? What caused this problem to start? In your own words, how would you describe this pain? Does the pain travel anywhere? Please be as specific as possible, and point to the where it goes if you need to help explain it. On a scale of 0-10 with zero being no pain and 10 being the worst pain you could possibly feel in your entire lifetime, how would you rate your pain at this time? On that same scale of 0-10 how would you rate your pain at the time that it began? When exactly was it that this pain began? Is the pain level the same in all areas or is it worse in some locations? How long has this problem been going on? What have you done about this problem up to this point in time? Has what you done helped? Has what you done made the situation worse or more painful? What medicines are you allergic to? What environmental things are you allergic to? What foods are you allergic too? How symptoms do you develop with these allergies? What prescription medications do you take on a regular basis? What are the dosages on each of those medications? Are you taking any medications other than those prescribed by a doctor? What are the dosages on each of those medications that you are taking? How much do you drink? How much have you ingested recently? Do you take any over the counter medications? What are those medicines and how often do you take them? Do you take any illegal drugs? What do you take and how often? When was the last time you took that? Has anything like this happened before? Can you describe what happened in the past and when? When was the last time you had anything to eat or drink? What was it that you had to eat? What was it that you had to drink? When did you drink it? What was going on prior to or leading up to the problem that you are having? 2 seconds or quicker is goal – capillary refill time is most useful for children, but is useful for anyone somewhat. “battle scars” behind ears, etc. Head – Check the scalp for cuts, bruises, swellings, and other signs of injury. Examine the skull for deformities, depressions, and other signs of injury. Inspect the eyelids/eyes for impaled objects or other injury. Determine pupil size, equality, and reactions to light. Note the color of the inner of the inner surface of the eyelids. Look for blood, clear fluids, or bloody fluids in the nose and ears. Examine the mouth for airway obstructions, blood, and any odd odors. Chest – Examine the chest for cuts, bruises, penetrations, and impaled objects. Check for fractures. Note chest movements a look for equal expansion. Abdomen – Examine the abdomen for cuts bruises, penetrations, and impaled objects. Feel the abdomen for tenderness. Gently press on the abdomen with the palm side of the fingers, noting any areas that are rigid, swollen, or painful. Note if the pain is in one spot or generalized. Check by quadrants and document any problems in a specific quadrant. Is the abdomen painful, tense, distended or rigid? Lower Extremities – Examine for deformities, swellings, bleedings, discolorations, bone protrusions and obvious fractures. Check for a distal pulse. The most useful is the posterior tibial pulse which is felt behind the medial ankle. If a patient is wearing boots and has indications of a crush injury do not remove them. Check the feet for motor function and sensation.Upper Extremities – Examine for deformities, swellings, bleedings, discolorations, bone protrusions and obvious fractures. Check for the radial pulse (wrist). In children check for capillary refill. Check for motor function and strength. Focused Physical Exam – Responsive Medical PatientThe focused physical exam of the responsive medical patient is usually brief. The most important information is obtained through the patient history and the taking of vital signs. Focus the exam on the body part that the patient has the complaint about. What is the patient’s mental status? Is he (she) seizing? Does he (she) have muscle twitching? Then GACCAT->VITALS->FOCUSED again and again… REASSESS!… REASSESS!… REASSESS! T Trauma to the C-spine? T Threats to you or your patient? http://ebooks-gratuit.net/recherche/Vital::Signs/ppt/1 – a lot of different powerpoints on vitals. http://searchfiletype.com/Abdominal-Emergencies-Abdominal-pain-is-a-frequent-fs52658.html – bunch of powerpoints on abdominal pain… do various searches on it for terms like coma, stroke, etc. http://www.reddit.com/r/ems/comments/23wnyz/complete_ems_abbreviationsterms/ – abbreviation list for the ems reddit. http://file2hd.com/ – another neat little tool to download various stuff that you want saved for future reference such as swf and mk4 files. http://emsbasics.com/welcome-to-scenarioville/scenarios/ – Scenarioville blog… it’s a blog with various EMS scenarios listed in the fictional town of Scenarioville. Interesting reading. http://emsbasics.com/digital-research-library/ – same blog as the scenarioville but different section. This is the “digital research library” section that lists a lot of different links to a lot of different medical articles around the internet. Good reading in your spare time. http://anaesthesiatoday.blogspot.com/2010/11/aha-cpr-guidelines-2010.html – Nice little blog on ems system with flowcharts. Usaf emt protocols app on google play store. I used a lot of various apps in studying for the class, but this one was great since it had nice flowcharts for most scenarios discussed in various chapters in the book… I’m more of a visual learner than a lot of folks, so flowcharts help me visualize processes a lot more than lengthy paragraphs do. http://emt-training.org/index.php – nice website notes on an EMT class… covers a lot of the basics. http://www.jems.com/articles/print/volume-39/issue-7/health-and-safety/ems-still-most-dangerous-profession.html – article about how EMS professions are one of the most dangerous ones in the world today. http://connect.jems.com/forum/topics/not-taking-safety-seriously – Jems forum topic about that particular article. 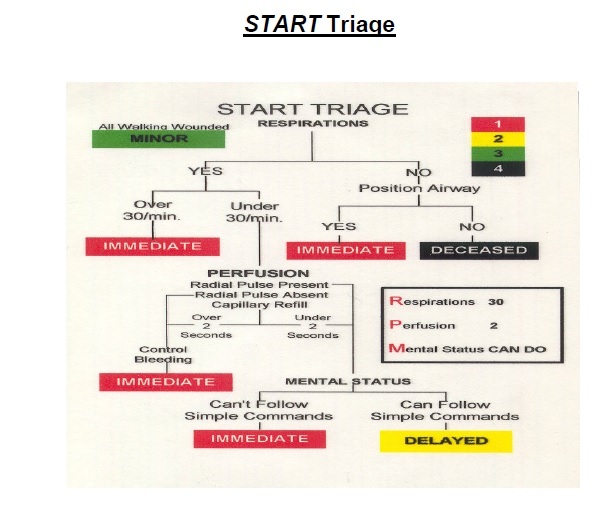 http://citmt.org/Start/flowchart.htm – diagram showing basics of START.